Schematic illustration of the decrease in day-to-night ocean heat transport (OHT) as the stellar flux increases and the underlying mechanisms. The decreasing trend of OHT results from weaker wind stress combined with less stellar radiation depositing energy at the dayside surface. (a): In the middle range of the habitable zone, the day-night surface temperature contrast is strong, the surface wind stresses are robust, stellar radiation absorbed by water vapor or reflected by clouds is relatively small, a large part of the stellar energy reaches the surface, and the ocean dominates the day-to-night heat transport. 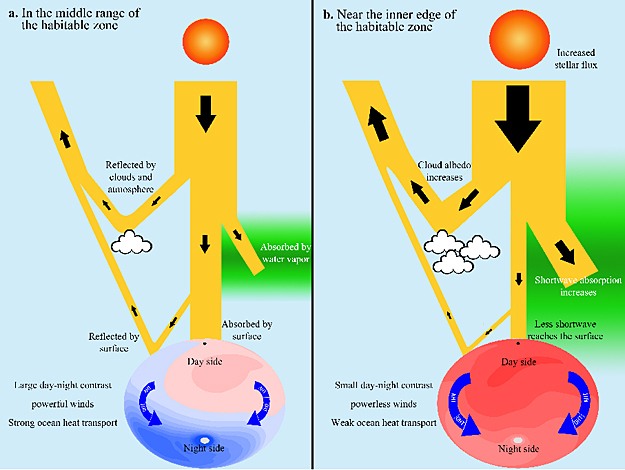 (b): Near the inner edge of the habitable zone, the surface is hot, the day-night surface temperature contrast is small, the surface wind stresses are weak, stellar radiation absorbed by water vapor or reflected by clouds is relatively large, a small part of the stellar energy reaches the surface, and the atmosphere dominates the day-to-night heat transport. However, the impact of ocean dynamics on the habitable zone's boundaries (inner edge and outer edge) is still unknown and represents a major gap in our understanding of this type of planets. Here we use a coupled atmosphere-ocean global climate model to show that planetary heat transport from the day to night side is dominated by the ocean at lower stellar fluxes and by the atmosphere near the inner edge of the habitable zone. This decrease in oceanic heat transport (OHT) at high stellar fluxes is mainly due to weakening of surface wind stress and a decrease in surface shortwave energy deposition. We further show that ocean dynamics have almost no effect on the observational thermal phase curves of planets near the inner edge of the habitable zone. For planets in the habitable zone's middle range, ocean dynamics moves the hottest spot on the surface eastward from the substellar point. These results suggest that future studies of the inner edge may devote computational resources to atmosphere-only processes such as clouds and radiation. For studies of the middle range and outer edge of the habitable zone, however, fully coupled ocean-atmosphere modeling will be necessary. Note that due to computational resource limitations, only one rotation period (60 Earth days) has been systematically examined in this study; future work varying rotation period as well as other parameters such as atmospheric mass and composition is required.